Tucker Carlson said even Idi Amin did not get the type of coverage WikiLeaks founder Julian Assange receives. 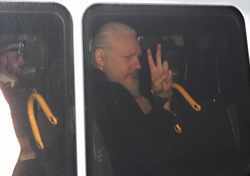 Assange was arrested Thursday at the Ecuadorian Embassy in London. Carlson said Assange is not sleazier than any journalist in Washington and has broke stories that others would win Pulitzers for. “At NBC, when they tell you ‘many believe’ something, it means they believe it,” Carlson said about the network’s coverage of Assange. TUCKER CARLSON, FOX NEWS: If you’ve watched the coverage of this story today on television, you likely came away with the understanding that Julian Assange is some form of Russian spy, who is in trouble because he stole classified documents from the United States government. But that’s factually wrong. It’s not true. Saying so isn’t a defense of Assange. We’re not here to promote him, or excuse any number of things he’s said over the years that we disagree with. But just so it’s clear: Whatever his sins, Assange did not steal documents from the US government. He did not hack the DNC’s servers, or break into John Podesta’s gmail account. There is no proof he is working for the Russian government, or ever has. Assange has never been charged with any of that, and wasn’t today, no matter what they tell you. JIM SCIUTTO: He is central to several cases. He’s central to Russian interference in the election, U.S. intelligence views him as a middleman, a cutout, that he was in effect part of this interference. He’s central, too, to questions about what the Trump administration, or Trump campaign, I should say, knew prior to the release of those materials, right? What were the communications between Roger Stone, et cetera… It’s possible that this is something President Trump himself is not particularly excited about. That was before the Trump election and the total war that followed, a war in which the media have definitively chosen a side. Press freedom? “Sure. As long as we agree with your politics.” The first amendment? “That all depends. Who’d you vote for?” The guardians of speech are now its enemies. The people charged with policing power are now colluding with it. There’s a reason you see John Brennan on NBC all the time. They’re all on the same team. We’re not saying any of this to defend Julian Assange. We just want to be absolutely clear about who hurts this country more. It’s not him. Previous ArticleData: Working Class American Men Struggle to Re-Enter WorkforceNext ArticleDid Ilhan Omar Help Benjamin Netanyahu Win Reelection?